How do your expenses add up? 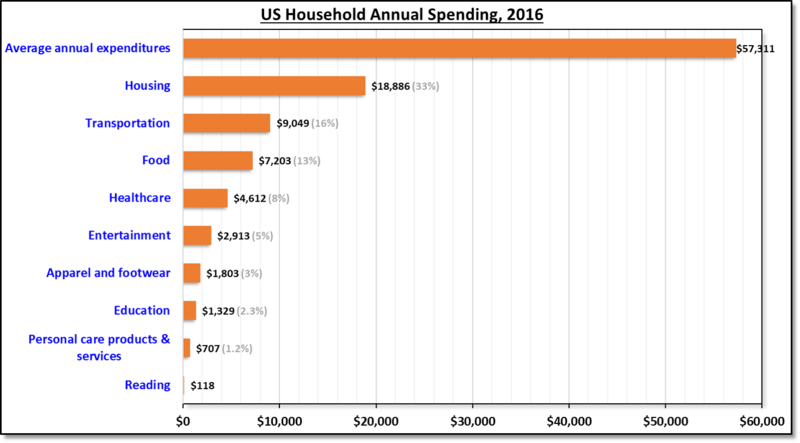 US annual household expenses for key items, 2016. Out of the annual expenditure of $57,311, housing makes up almost a third of household expenses followed by transportation (16%) and food (13%). After paying taxes, US households spend almost all of their annual income of $57,319 mainly in housing, food & transportation. A third of this income goes into paying for housing. Although majority of this expense is for paying mortgage, a third is paid in interest, insurance, taxes, utilities, and other housing expenditure when averaged across all the 125 million households. The average monthly household expense on housing is $1,574. At an average of 1.9 vehicles per household, Americans spend one in every seven dollars for transportation. Half of this is to buy their vehicles and other half goes into, gas (3.3% of total), insurance (1.5%), and maintenance (1.5%). The expenses on public transport at minuscule at 1.1% (or $623 per household). This shouldn’t be a surprise since US has one of the lowest spending on public transport compared to other developed nations. Most of the world’s population spends a large part of their income on food, but a US household barely spends a tenth of their income on eating. In highly subsidized food and dairy industries, states across the country have tried to control the grocery prices through low taxes, farmer subsidies, and strong competition. Although healthcare is a hotly debated issue, the average expense is about 8%, varying from 3.4% for younger population (below 25 years) to 15.4% for those above 75 years. Other major US annual household expenses are in entertainment ($3k), clothing ($1,803), education ($1,329), and personal care ($707). Those below the age of 25 years spend almost 9% of their income on education. But other major expenses are pretty well distributed across different age groups. This should serve as a good template for every family to see how their income leaks out of their wallets.